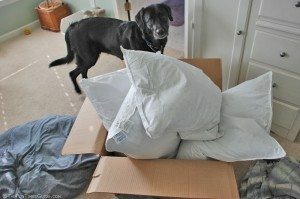 We recently invested in a new set of down pillows for our master bedroom. Actually two sets of pillows — one King size and one Standard size. These are some super-duper pillows, too! The only thing is, sometimes I think our dog enjoys those pillows more than we do. Okay, not really. We actually love our new Hampton Inn pillows. But by the looks of these pictures, you can see that our dog thinks they’re the cat’s meow, as well! 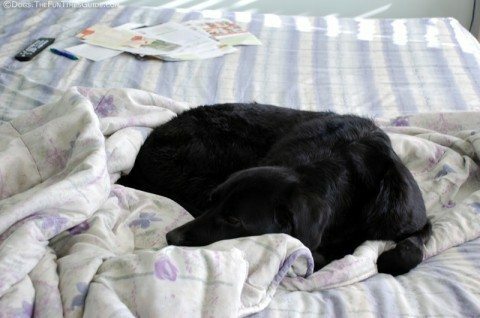 Tenor (our dog) never used to spend much time on our bed. That is, until we got these pillows. 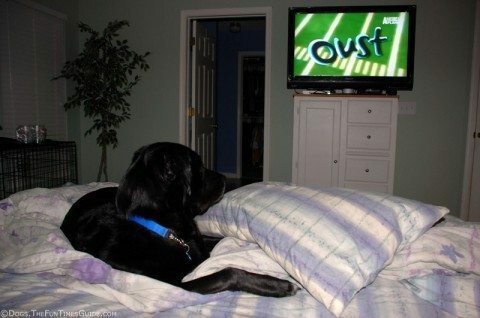 Now, he likes to prop his chin on one of the pillows while he’s watching TV. Or lean up against one when he’s just hanging out. 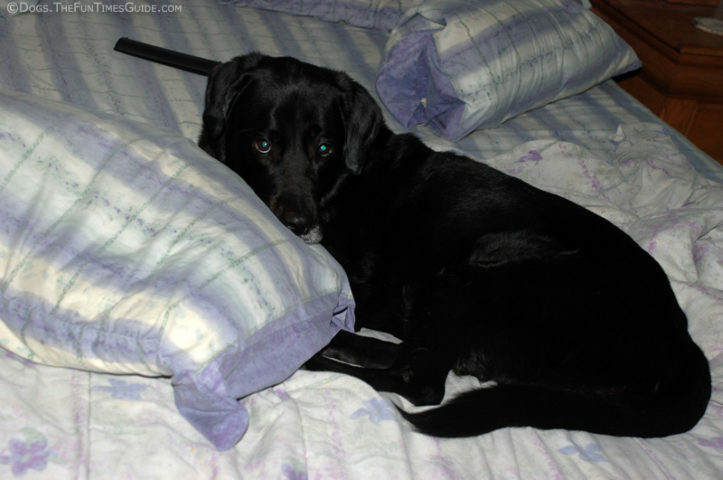 And whenever he’s ready for a good snooze, he’ll hunker down and cozy right up to one or two of these pillows. 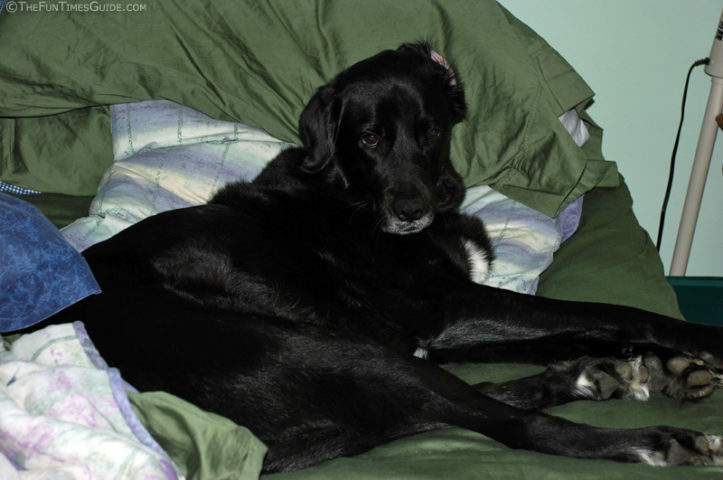 I’ll be honest, there was a period of many many years when we didn’t allow any of our dogs to get up on our bed. Which isn’t necessarily a problem with less-dominant dogs. But when you introduce a more dominant dog into the mix (like we did), if you still allow your dogs on your bed, then they’re getting mixed messages about who’s the boss and what their place is — in terms of rank and the dog pack hierarchy. That’s why we made a point of keeping our dogs off our bed for several years. But when we eventually got down to only one dog (a very submissive dog at that), this simply wasn’t an issue anymore. Plus, I have to admit — and as silly as it sounds — I think we missed the “cuddle time” with our dog. If we should ever get another dog — meaning 2 dogs in the family once again — then I’m pretty sure we’d go back to “the no bed rule” with our dogs. Because we’ve learned firsthand how difficult it is dealing with dominance issues when you have more than one dog. But I’m just glad our new Hampton Inn pillows are such a hit in our home. They were certainly worth every penny!